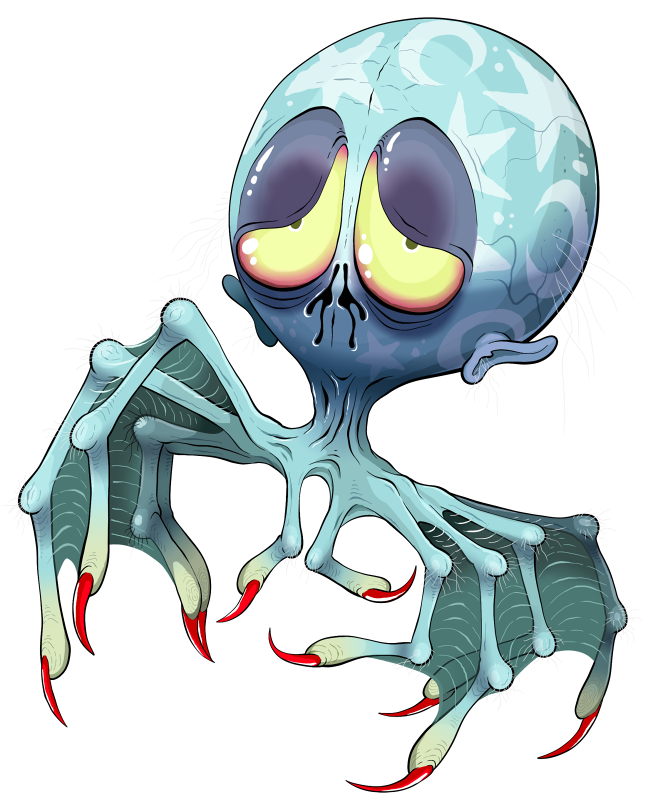 The Dreerie is a sleepy, passive psychic bioweapon that induces sleep and invades dreams. This gas-filled drifter feeds on little more than airborne bioparticles, light and the occasional bird or bat, and would be harmless if not for its natural drive to wield its psychoweaponry. Its huge, bulbous head houses surprisingly little functioning brain, most of its cerebral tissues modified into a cognotransmission system and a network of sacs in which its specialized Homonculoids are manufactured from its own cells. Unleashed as a sparkling, colorful cloud of powder, these nanomonsters invade the nervous systems of compatible subjects, induce an instantaneous sleep state and establish two-way communication with their parent Dreerie, allowing the monster full access to the host's thoughts and memories. Victims experience this attack as a strange and vivid dream varying in subject matter, but always bleak and somber in tone, with the Dreerie itself presiding sluggishly over the gloomy scenery and pointless events. Losing themselves to the drab and pessimistic atmosphere, few creatures muster the emotional willpower required to recognize the danger and fight back against the monster. Though cerebral "hacking" offers no biological benefit to the Dreerie, it experiences physiological withdrawal symptoms after seven to ten days without probing another mind, losing its own mind as its body pales and desiccates. The effect is superficially comparable to accelerated aging, each "dream drift" rejuvenating the monster with a surge of reward hormones. Seeking densely populated areas, the typical feral Dreerie is content to float liesurely over rooftops, dust homes through open windows or ventilation systems, wait for residents to sleep of their own volition, and enjoy a few harmless moments of dream-drifting that the subjects will rarely recall upon awakening. A more aggressive individual, however, may single out a particularly vulnerable, isolated target to plunge into an indefinite coma, reveling in the highs of their dreaming mind until the subject dehydrates or starves in its sleep. A Dreerie is a powerful ally against any sentient, biological adversary, requiring only that the target breathe its homunculoid dust before effectively shutting them down for as long as necessary. Though it cannot imprison more than one being at a time in an unconscious state, it may selectively alter and remove minor information as needed from the victim's mind to further neutralize its threat potential. With advanced training and concentration, the Dreerie can even induce somnambulism in weaker-minded subjects, compelling them to physically act out dream events. BUOYANCY: the Dreerie's gas-filled body is slightly lighter than air. 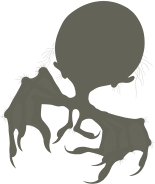 SLEEPY SAND: the monster can expel a "dust cloud" of nanomonsters to facilitate its remote mental connectivity and induce unconsciousness. DREAM DRIFT: the monster can invade the mind of a contaminated subject while it alters their memories and keeps them effectively imprisoned in their own dream.